Test Chambers are a vital part of the Portal series and the Aperture Science Enrichment Center. Via the Security Cameras fixed onto the walls of test chambers at various points, GLaDOS can track a test subject's movements and progress. There are hundreds and more test chambers throughout the Enrichment Center, which can be easily reconfigured and recycled to form another new test chamber. In Portal 2, these chambers can be swiftly created by GLaDOS with the usage of robotic arms carrying panels and combining them with other panels to form a ceiling, floor, and walls. Aesthetically, these chambers bear resemblance to a hospital with its sterile environment; due to the lighting used within chambers, and the black and white coloring of the walls, floors, and ceilings. In Portal, challenge mode test chambers can be found in the game's "Bonus Maps" menu option. In Portal 2, the challenge modes can be played via selecting "Play Challenge Mode" in either single-player or co-op. In Portal, the stats will be compared to the goal, and if you matched the number of portals / steps / time to the goal (or got less than it), it will get harder and harder. In Portal 2, player stats will be saved into the Steam leaderboards. This allows the Steam community to keep track of friends and other players who have beaten them in either least portals created, or least time taken to complete a test chamber. Available only in Portal, these are variants of the test chambers which have been redesigned with an advanced difficulty curve, for instance by decreasing the number of portalable surfaces, or by increasing the presence of Goo. Like challenge chambers in Portal, advanced chambers can be played via the "Bonus Maps" section on the main menu. 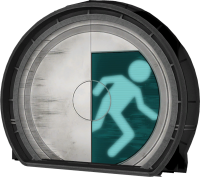 The Portal 2 Sixense MotionPack DLC contains advanced chambers for Portal 2. Portals - The core mechanic of the game, the "worm holes" used to complete the test chambers. Introduced in the Relaxation Vault. Heavy Duty Super-Colliding Super Button - Can be pressed by the player or held with a cube, the button acts like a switch, turning on and off different things (opening doors for instance). Introduced in Test Chamber 00. Vital Apparatus Vent - The air vent delivering the cubes into the chambers. Introduced in Test Chamber 00. Victory Lift - A vertical variant of the Unstationary Scaffold that automatically rises if a player is upon it, and descends if unoccupied. Introduced in Test Chamber 06. High Energy Pellet - An energy ball that needs to be put in its receptacle to power other objects. Introduced in Test Chamber 06. Unstationary Scaffold - A platform used for transportation along a rail. Introduced in Test Chamber 07. Turrets - Military grade turrets used for area denial. They fire bullets at players that enter their field of view. Introduced in Test Chamber 16. Aerial Faith Plate - A launcher that throws the player and any objects at a fixed trajectory. Introduced in Chapter 2 Test Chamber 5. Thermal Discouragement Beam - A laser beam fired in a straight line. Must be avoided or redirected using a Discouragement Redirection cube. Introduced in Chapter 2 Test Chamber 1. Cubes (Edgeless Safety & Discouragement Redirection) - Cubes that can be used to hold down buttons for example (Discouragement Redirection introduced in Chapter 2 Test Chamber 2 and Edgeless Safety introduced in Co-op Course 1 Chamber 2). Hard Light Bridge - A semi-translucent, solid 'sheet' of light that can act as a bridge or wall. Introduced in Chapter 3 Test Chamber 11. Gels (Propulsion, Repulsion & Conversion) - Can coat surfaces and apply different effects. Repulsion introduced in Chapter 6 Enrichment Sphere 2, Propulsion Chapter 7 Enrichment Sphere 5, Conversion Chapter 7 Enrichment Sphere 6. Excursion Funnel - While inside this funnel of energy, objects will be unaffected by gravity and will travel along the path of the funnel. Introduced in Chapter 8 Test Chamber 1. Edgeless Safety Cube Receptacle - Place Edgeless Safety Cubes into these receptacles to activate different types of objects. Introduced in Co-op Course 1 Chamber 2. This page was last modified on 18 August 2018, at 01:43.